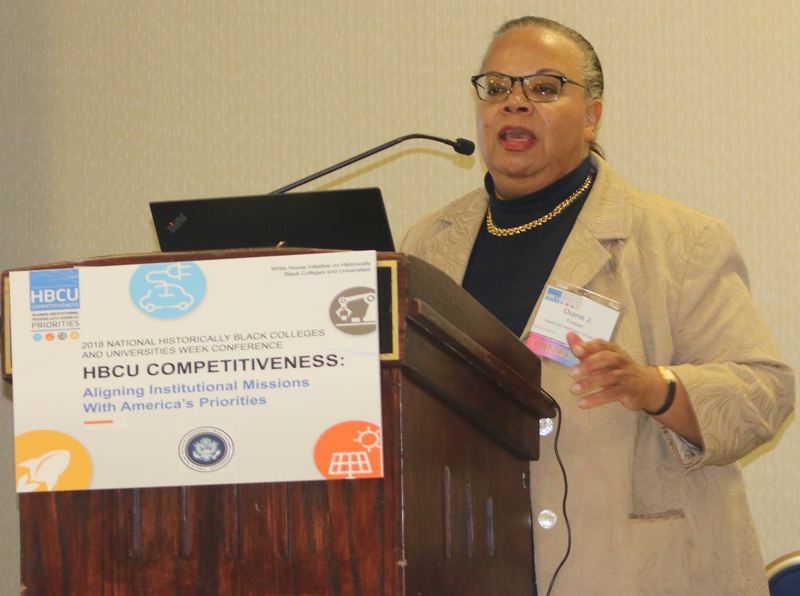 During the 2018 HBCU Week activities sponsored by the White House Initiative on HBCUs, Diane Frasier, who heads contracting activity at the National Institutes of Health, gave an overview of the agency’s plan to increase biomedical research contracts with Historically Black Colleges and Universities. “We have been working for quite some time on how we can increase HBCU participation in contracting,” Frasier said, noting that NIH currently awards roughly $6 billion in research contracts for the Centers of Disease Control and other health-related departments within the agency. Sharing slides that she described as “disturbing,” Frasier said the data makes it obvious “why there is a concerted effort to increase HBCU engagement.” Out of that $6 billion budget, only $2 million currently is going to HBCUs. “There is a huge gap for contracts with minority institutions, and we need to turn that around,” Frasier said. Create a procurement database to track and compile data regarding the types of acquisitions pursued, success and failure rates, post submission feedback, and common pitfalls of the pilot HBCUs. Develop best practice strategies using existing small business rules/regulations and leverage NIH HBCU resources for potential opportunities. Develop a training curriculum for participants using best practices. Develop a reference resource guide (print and digital) for participants. Compile a comprehensive database containing existing NIH HBCU programs. Develop an exclusive HBCU portal for Acquisitions and Grants, centralizing the training curriculum, resource guide, and NIH HBCU program database. If NIH fulfills these objectives, Frasier said, the agency will assist HBCUs perform on a contract, as well as build their capacity to secure future contracts. “We want to ensure that HBCUs are trained in the acquisitions process,” Frasier said. There are three phases of Path to Excellence and Innovation, beginning with recruiting HBCUs that have biomedical research capabilities and ending with monitoring contract submission statistics. 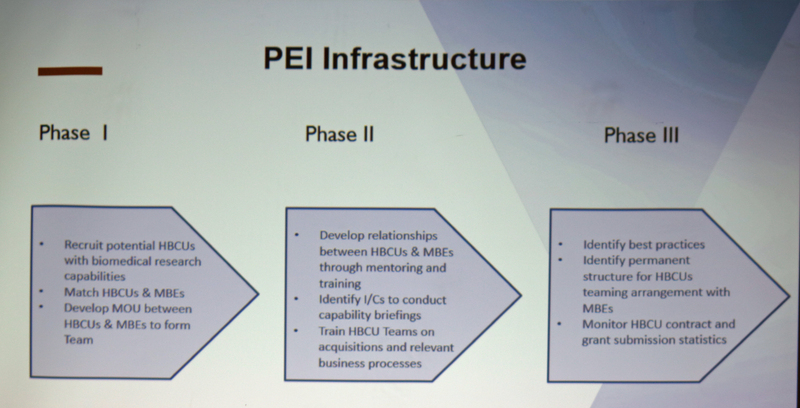 This slide from Diane Frasier’s HBCU Week presentation outlines the three Phases of the PEI pilot.